The IPO was subscribed 17.24 times at a price band of Rs 109-110 per share. Equitas Holdings made a strong debut as the stock opened 32% higher at Rs. 145 against its IPO price of Rs.110 per share on the NSE. The stock hit a high of Rs. 147 and a low of Rs. 139. 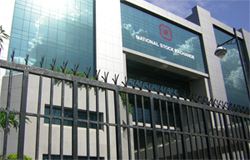 The IPO received total bids for 29,95,84,575 shares as against the issue size of 13,91,91,802 shares. The company raised Rs. 653 crore from anchor investors. The company allotted 5.93 crore shares at Rs.110 per share.